We have a few remaining spots for our “popular” BRUNCHES. This one is for our Spring Brunch (event) and it is available on April. Saturday, April 13th, Sunday, April 14th (SOLD OUT). No excuses to not be able to make this one! Along with a fantastic menu you will love the setting and atmosphere! Reserve your spot, and join us for an intimate and delicious dining experience! Our spots sell out fast so don’t dilly dally! Peppermill BRUNCH ETIQUETTE: Other than this teeny tiny bit—–we start our brunches right on time so be prompt and come ready to eat! The rest is pretty laid back. We like to have fun, so we want YOU to have fun. Dress however you wish- we don’t judge! You want a TOUR? If you’ve never been to the Peppermill, we welcome tours at the end of our meals! Just mention it. We want you to feel free to sit and visit with the other guests as well as Belle & Boo (the innkeepers)! This makes the dining experience even better and we L❤︎VE meeting new people! Orange Carrot Kuchen (what’s kuchen you ask—a fancy word for cake!) Cause we like to be fancy and who doesn’t love dessert for brunch? 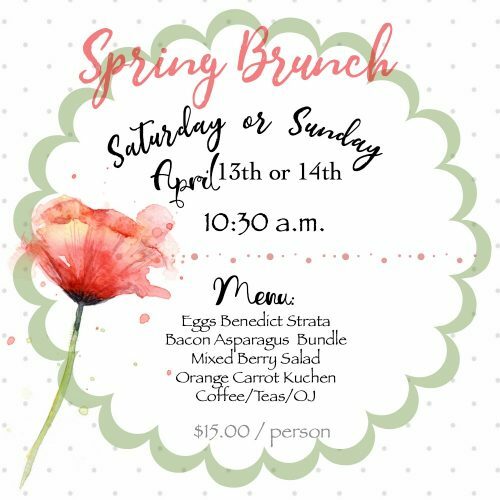 JOIN us for a fun-delicious BRUNCH! Get your spot now!!! As always, for future updates on our events & happenings—be sure to follow us HERE or subscribe to our website!